In recent years, there has been an increasing interest in using micro-renewable energy sources. However, planning has not yet developed methodological approaches (1) for spatially optimizing residential development according to the different renewable energy potentials and (2) for integrating objectives of optimized energy efficiency with other environmental requirements and concerns. This study addresses these topics by firstly presenting a new concept for the regional planning. 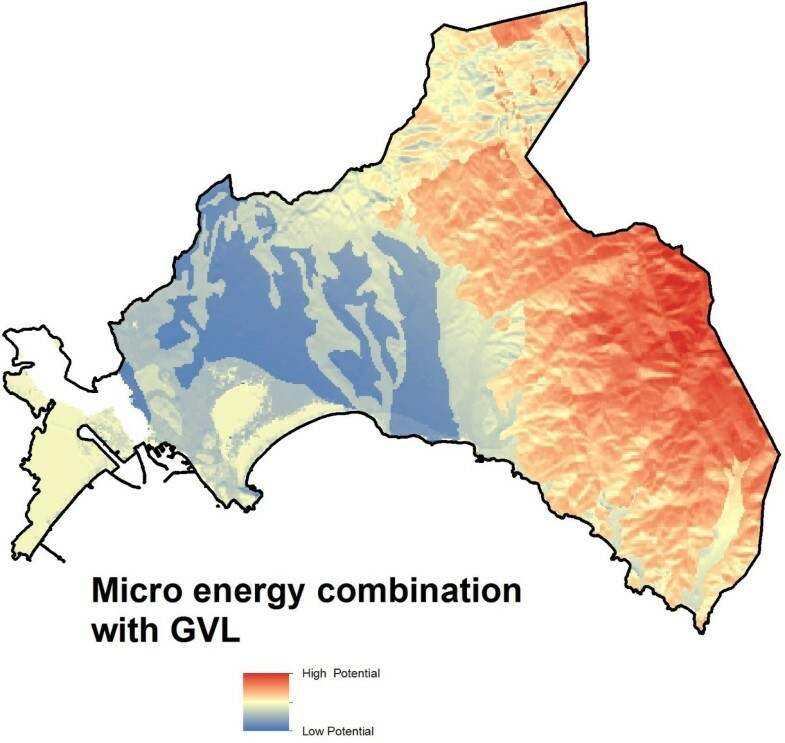 The methodological approach for the evaluation of spatial variations in the available energy potential was based on the combination of existing methods adapted to the local scale and data availability. For assessing the bioenergy potential, a new method was developed. Other environmental criteria for deciding about sustainable locations were identified through a survey of more than 100 expert respondents. This survey involved pairwise comparisons of relevant factors, which were then translated into relative weights using the Analytical Hierarchy Process. Subsequently, these weights were applied to factor maps in a Geographical Information System using a weighted linear combination method. 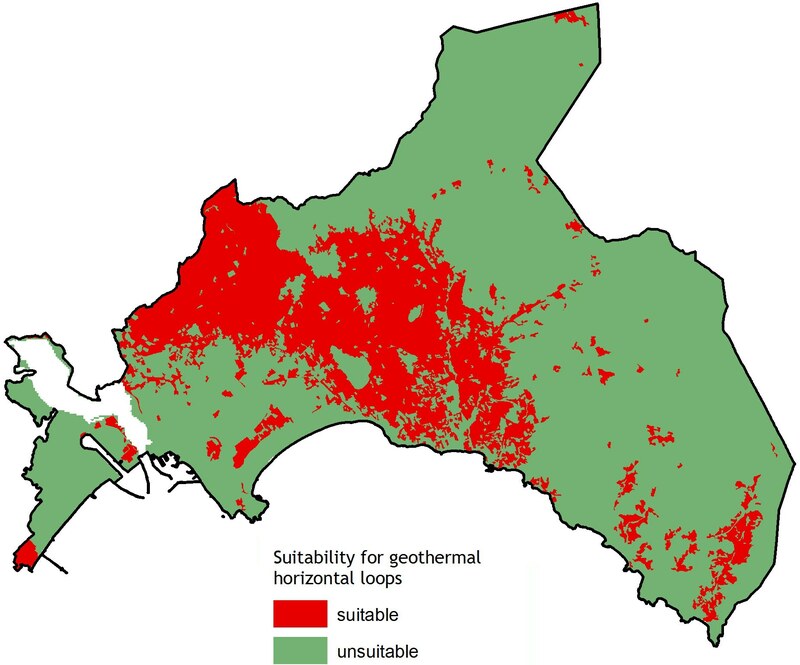 In the test region, the eastern metropolitan area of Cagliari, Sardinia, this analysis resulted in the designation of suitable areas for new settlements and preferred locations for micro-renewable technologies. Based on expert preferences, a number of alternatives for future housing development were identified, which can be integrated in the early stages of land use or development plans. The method proposed can be an effective tool for planners to assess changes and to identify the best solution in terms of sustainable development. A sustainable future for cities significantly depends upon the integration of energy efficiency in regional and urban planning. About 40% of the final energy demand is needed to heat and power homes. This represents a major source of greenhouse gas emissions, making energy savings in the field of residential development a key element of the European climate change strategy . In this context, Europe is also faced with the challenge of implementing growing amounts of intermittent power sources such as micro-solar and wind sources in the electricity grid. The generation of renewable energy is characterized by intermittency; therefore, it is imperative that a mix of sources should be selected and used along with the suitable energy storage mechanisms in order to best utilize the available renewable energy resources and ensure the continuity of supply . Two European projects exemplify the state of the art in the energy-efficient residential development: the BedZED development in the south of London and the Vauban development in Freiburg, Germany. These two eco-districts are globally recognized to be models for sustainable environmentally oriented planning using solar energy (photovoltaics and solar thermal collectors). In the BedZED project, the use of solar energy is maximized through the integration of solar cells into the vertical south-facing facades and also through a large installation on the south-facing roofs . In Freiburg, the principles of energy savings and solar optimization are early considered in the planning phase of housing development, e.g., by defining the orientation and position of buildings or by obligatory low-energy construction requirements . These urban multi-residential housing developments are not only models for energy saving, but they also take into account social and economical aspects. However, the geographical distribution of the renewable energy potential is rarely considered or estimated in the planning of new residential areas [5, 6]. Also, in selecting the location, environmental criteria in combination with micro-renewable potentials are still neglected. Therefore, the state of the art in the field of energy efficiency [7, 8] may be advanced by combining the different energy sources in new housing developments and planning their location by estimating the energy potential available for the whole area under consideration. Renewable energy supply is site-specific and variable . A restriction on secure supplies from single renewable energy sources is their output variability. Supply insecurity can be increased by demand variability, especially where this correlates with times of high energy output by renewables, better predictability of their generation output, and the complementarities of different power sources. Also, the combination of different renewable energy sources can increase the supply security. In recent years, several renewable energy potential mapping methodologies have been developed (e.g., solar irradiation and wind estimation, geothermal and biomass energy) [10–12]. These methods can be used for complementing the urban planning approaches. However, the methodologies have been developed for very small scales and cannot be applied unmodified for selecting new housing locations . Therefore, it is necessary to either adapt the existing methodologies or develop new ones. Energy efficiency should be integrated from the start of the land use planning process in order to guide the future development to support the sites with the best potential for using renewable micro-generation. These potentials can be developed in a sustainable way by using multicriteria evaluation methods in a Geographical Information System (GIS) to help optimize new settlements in terms of multi-functionality. There is a history of research using such multicriteria evaluation techniques to support collaborative decision-making processes by providing a framework where stakeholder groups can explore, understand, and redefine decision problems with respect to housing location [14, 15]. · How to calculate the geographic distribution of energy potentials? How to produce energy potential maps? How to identify the best energy mix combinations? Which criteria and algorithms are needed for identifying the theoretical energy potential in terms of the different energy sources? · Which environmental and landscape criteria are considered most relevant for the assessment of new housing development with micro-renewable technologies? · How to support decision makers or planning in the challenge of including multiple criteria in housing development decisions? · Methodologies (existing, adapted, or newly developed) to estimate the micro-renewable energy potentials in a spatially explicit manner. · Methodologies for identifying the suitable areas for new sustainable settlements using micro-renewable technologies which enable to support decision makers in planning. The results of testing these methods are presented for the region of Cagliari in Sardinia. Part of the approach is not only based on the existing, originally small scale, but also on methods for energy potential assessment, which were pre-tested in the Hannover region (by Master students in cooperation with the State Office for Mining, Energy and Geology (LBEG) . In a second step, the methods were adapted to local/regional scale planning. As there was no suitable method for assessing the bioenergy potential, a new method was developed. This resulted in assessments of the theoretical (potential) supply. Because of the existing technical, ecological, economic, and social restrictions, such theoretical amounts can only be exploited up to a certain percentage . Expert preferences were used to weight multiple assessment criteria for housing developments. These preferences were obtained through a survey conducted with students, academic planners, regional planners, and public authorities in Italy, Germany, and the UK. This expert-based approach was chosen because in most European countries, no clear-cut standards exist about the suitability of micro-energy generation in residential areas (in contrast, e.g., to emission standards). Expert opinions were a simple way of priority setting in such complex decisions. In addition, such a method allows the results of different preferences to be modeled and local or regional stakeholder opinions and interests to be included. The energy potentials and expert preferences were ultimately combined in a GIS-based analysis to identify the most appropriate housing sites on a regional scale. This analysis made use of multicriteria evaluation (MCE) techniques which are one of the most common GIS-based tools. They have been used to support decision making on complex problems such as site selection, land suitability, resource evaluation, and land allocation [18–22]. Over the last two decades, several MCE methods have been implemented in a GIS environment, including weighted linear combination (WLC) and its variants [23–27] and ideal point methods [28, 29]. Among these procedures, WLC and Boolean overlay operations, such as intersection (AND) and union (OR), are the most widely used [15, 21] and were adopted in this research. 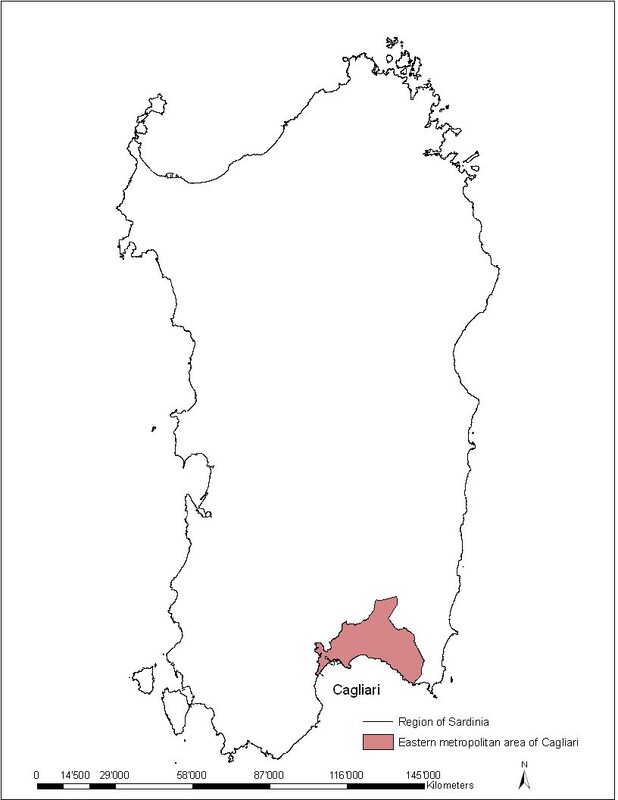 The eastern metropolitan area of Cagliari (Figure 1) covers 591 km2 in the south of Sardinia and has a population of 322,392 inhabitants . Cagliari is the capital of Sardinia, situated at the southern shore of the island and has 157,222 inhabitants . Eastern metropolitan area of Cagliari. The region is characterized by rural areas around the cities with a large amount of agricultural land (around 46.72%). Other uses, such as residential, commercial, and industrial areas, cover about 40% (land use data, region of Sardinia). Table 1 lists the main geographical data sources used for the regional assessment. These were supplemented by shape files from the Regional Landscape Plan of Sardinia, scale 1:10,000. The r.sun model operates in two modes. In mode 1, the model calculates the instant time (in seconds) of raster maps of chosen components (beam, diffuse, and reflected) of solar irradiance (in watts per square meter) and the solar incident angle (in degrees). In mode 2, the raster maps of the daily sum of solar irradiation (in watt hours per square meter per day) are computed as an integration of irradiance values that are calculated within a set day. In this study, mode 2 was used because we needed to calculate raster maps representing the annual average of daily sums of global irradiation for horizontal surfaces. To compute the irradiation raster maps, r.sun requires only a few mandatory input parameters - digital terrain model (elevation, slope, aspect - elevin slopein aspin), day number (for mode 2), and additionally, a local solar time (for mode 1). The other input parameters are either internally computed (solar declination) or the values can be set to fit the specific user needs: the Linke atmospheric turbidity, ground albedo, beam, and diffuse components of clear-sky index, and time step are used for the calculation of all-day irradiation . where v = wind speed at height z above the ground level; vref = reference speed, i.e., a wind speed we already know at height zref; z = height above the ground level for the desired velocity, v; and zref = reference height, i.e., the height where the wind speed is measured vref. The exponent α is an empirically derived coefficient that varies according to the stability of the atmosphere. For neutral stability conditions, α is approximately 0.143.
where PEWS = specific heat extraction capacity, and λ = heat conductivity of the rock. To obtain the specific heat extraction values, the geology was divided in two homogeneous layers: unconsolidated and solid rocks. Further information on the geological stratification for vertical loops and soil characteristics for horizontal loops was obtained from Dott. Geol. Fausto Pani, freelance, and Prof. Giovanni Barrocu, Cagliari University. Given the focus on housing development, not every type of biomass is relevant. Attention was focused on wooden biomass which is suitable for producing heat and electricity in residential areas with the installation of a cogeneration system. Important criteria for identifying the potential include the distance of the source of wood from the settlement and the capacity of the forest in terms of the wood reservoir. From an economic perspective, the energy-efficient use of biomass can be defined as a use within a radius of 30 km around a potential biomass facility . According to the sustainability principles, e.g., the needs of localizing new settlements near the biomass source, we assume that the energy biomass efficiency is related to a use within a radius of 15 km around a potential biomass facility, as shown in Equation 4. We assume that the biomass energy potential Pi is defined as the theoretical qualitative potential for a hypothetical settlement location or users Vi. where Pi = biomass energy potential, Vi = potential settlement, Aj is the forest cell area, A is the total forest cell area, dij is the distance between the centers of the cell of settlement potential location and of the cell of the forest areas dij ≤ 15 km, and Tj is the factor depending on transport and wood extraction cost. To differentiate between the areas of varying potential, a Monte Carlo method was introduced. Broadly speaking, Monte Carlo integration methods are algorithms for the approximate calculation of the numerical value of a definite integral, usually multidimensional ones, in our case the sum of forest areas (cf.). The usual algorithms evaluate the integrand at a regular grid. Monte Carlo methods, however, use random samplings to approximate probability distributions. This is performed by selecting some numbers of random points over the desired interval and summing the function evaluations at these points . The suitability maps of the theoretical energy potentials were integrated into combined layers showing the best locations for the new settlement development according to the most appropriate energy mix for the area under consideration. Maps were normalized and two versions were produced depending on whether geothermal vertical or horizontal loops were included. Decisions about the spatial resource allocation require prioritizing multiple criteria. Different criteria were selected for (1) assessing housing development in general as well as for (2) settlements with micro-renewables. The selection of criteria took into account the possible environmental and landscape impacts as well as the availability of relevant geodata in order to transform the preferences into spatially explicit representations. The criteria used in this research were proximity to existing urban areas, proximity to major roads and train lines, distance from environmentally valuable and vulnerable areas or from protected areas, proximity to water (lakes and rivers), and the slope gradient (see Table 2). Other factors such as the location, size, and accessibility of a site and its proximity to amenities and services are also important for future housing developments. These could be considered on a broader scale. The criteria were divided into continuous suitability factors and constraints (binary yes/no restrictions). The constraints were built-up areas, water (lakes and rivers), and areas characterized by hydrogeological instability. The criteria for the survey of the settlements with micro-renewables shown in Table 3 focused on landscape and environmental impacts, because the technical factors were included in the potential maps. Both parts of the survey were conducted in Italy, Germany, and the UK and sought to gain insights into perceptions about new energy-efficient settlement development. This required the participation of people who had expert knowledge regarding landscape and environmental planning and/or renewable energy, so the survey focused on students and academic planners, regional planners, and public authorities. The questionnaire was distributed in person and by email, with participants returning the completed surveys in the same ways. The expert preferences were converted into values using pairwise comparison methods, a procedure in the Analytical Hierarchy Process (AHP) . As an input, the method takes the pairwise comparisons of the different criteria and produces their relative weights as an output. According to the relative importance, the weights, which were assigned to the different criteria, were calculated using MathCAD, an engineering calculation software. Consistency ratios were also calculated to assess the reliability of the pairwise comparisons . To identify the optimal sites for new residential areas by using micro-renewables, the three GIS layers (energy potentials, suitability for new settlement development, suitability for new settlements with micro-generators) were overlaid. This integration was conducted using Spatial Analyst functions available in ArcGIS 9.x . Parameters such as the albedo factor (0.2) and the Linke turbidity (3.0) were assumed constant across the region as a first approximation. The clear-sky indices were not available. The influence of terrain shadowing was taken into account by setting the -s flag. 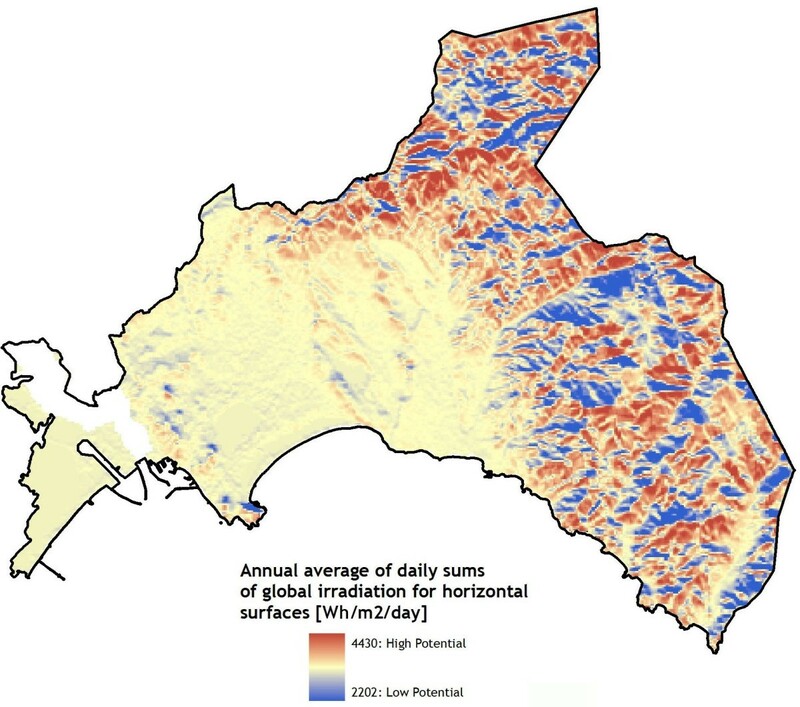 After validation of the data, the output raster map showed the annual average of the daily sums of global irradiation for horizontal surfaces (in watt hours per square meter per day) (see Figure 2). Annual average of the daily sums of global irradiation for horizontal surfaces (Wh/m 2 /day). To create the wind energy potential maps, speeds at 25 m above the ground with 1-km resolution were used. The data were derived from the Italian Atlas Wind Energy (Atlante eolico italiano) developed by the Genoa University and the CESI research center . Equation 2 was applied to obtain a final average wind speed raster map (at 10 m above the ground) with a resolution of 90 m (see Figure 3). For the unconsolidated rocks, there were some data limitations. Therefore, the thickness was sometimes only a rough estimate. The data for solid rocks were more accurate. The information regarding the groundwater flow component was not considered according to the VDI 3640 German directive. 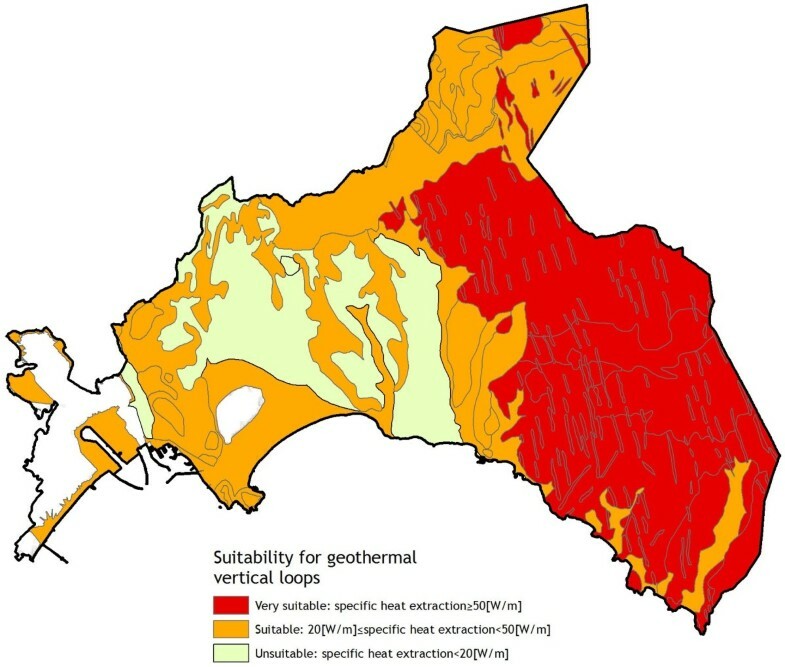 The geological map of the region of Sardinia, scale 1:200,000, was consulted to evaluate the specific heat extraction capacities, which were combined by values from the literature with regard to the specific heat conductivity (cf.). The resulting map was classified into three categories (see Figure 4). The unsuitable areas are not suitable for economic reasons. Geothermal energy potential for geothermal vertical loops. The geological map, the map for irrigation, and the land use map (scale 1:25,000) were considered to select the suitable and unsuitable areas for the installation of horizontal loops. Given the variety of soil conditions (e.g., evapotranspiration) and characteristics (e.g., presence of aquifers), soil types, and the absence of quantitative data regarding all these factors , it was only possible to give a qualitative potential estimation for the use of horizontal loops on this scale, as is shown in Figure 5. Geothermal energy potential for geothermal horizontal loops. The study did not take into account the factor Tj in Equation 4 which depends on road types and conditions as well as variable factors such as fuel prices for wood transportation and extraction costs, because the necessary data were not available. These factors can be better considered in a more detailed local view. A grid with a 250-m spacing was overlaid over a larger section of the eastern metropolitan area of Cagliari. A total of 5,000 random points were used, giving an average density of around 1 point per 250 m2. 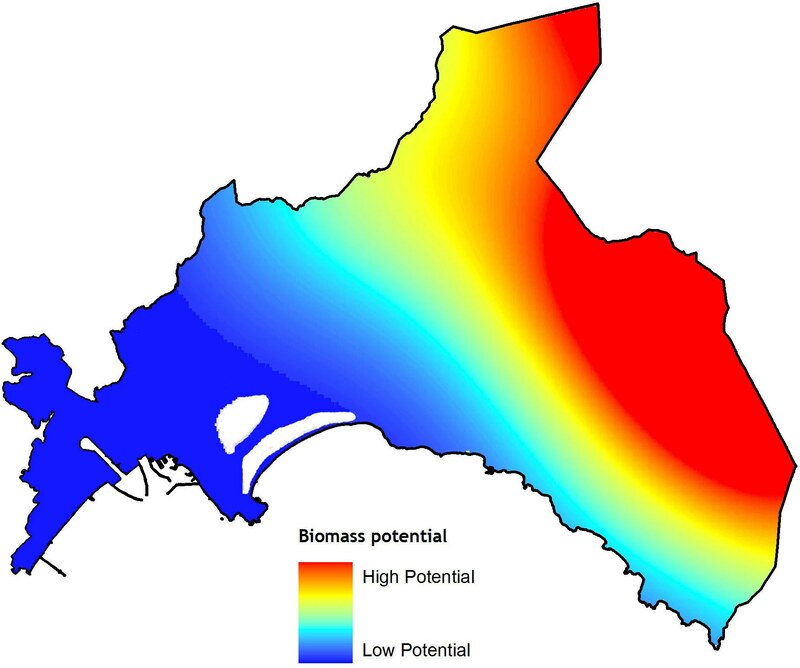 After the application of the Monte Carlo integration to the existing data, a biomass potential map was generated (Figure 6). We assumed that all the micro-energy potential maps are of the same weight. 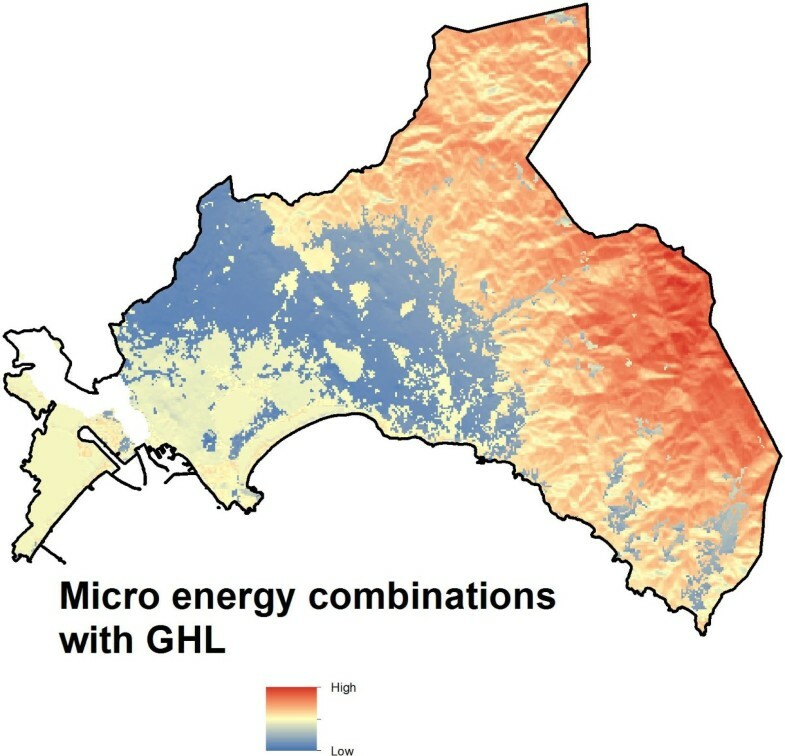 The maps obtained show the best locations for the integration of solar, wind, and biomass micro-generators with geothermal vertical loops (Figure 7) or horizontal loops (Figure 8). Best energy mix potential for solar, wind, and biomass micro-generators using geothermal vertical loops. Best energy mix potential for solar, wind, and biomass micro-generators using geothermal horizontal loops. A total of 120 questionnaires were completed, but only 108 were considered further (consistency ratio < 0.1). As shown in Table 4, for each category of experts, we had a minimum of 15 valid questionnaires. Obtained from students and academic planners (S.&AP.) as well as regional planners and public authorities (P.&PA.). DE, Germany; IT, Italy; UK, United Kingdom. English experts preferred a compact development close to the built-up areas (S.&AP. : weight 0.29; P.&PA. : weight 0.35). The German experts gave the same weight to an urban development near roads and train lines (0.22). In terms of the distance from the environmentally valuable and vulnerable areas, Italian and German students as well as academic planners expressed a similar preference (0.34; 0.31) with the Italian and German regional planners and public authorities (0.23; 0.24). The Italian experts preferred a development that is close to lakes and rivers for attractiveness reasons (0.15; 0.17). German and Italian regional planners and public authorities gave the same consideration to the slope gradient (0.15). Table 5 presents the weights for each criterion regarding the new housing development obtained from students and academic planners (S.&AP.) as well as regional planners and public authorities (P.&PA.) from each nationality. The weights sum to 1 with a higher value corresponding to more emphasis on the relevant criteria. Table 6 shows the averages of the standard deviations expressed as a percentage of the means for the different expert groups and nationalities. These results show some variation in weighting but do not exceed 100% so the variations are not too high. S.&AP., students and academic planners; P.&PA., regional planners and public authorities; SD, standard deviation; DE, Germany; IT, Italy; UK, United Kingdom. The final suitability maps were identified through the expert survey localizing the new settlement with renewable energy (see Table 7). The German students and academic planners (weight 0.54) as well as regional planners and public authorities (weight 0.60) gave more consideration to the visual impact caused by solar panels and solar thermal collectors on the cultural heritage. Italian academic (0.58) and environmental planners (0.54) and English academic (0.54) and environmental planners (0.54), by contrast, more intrusively considered the solar power plants near landscape-protected areas and other beautiful areas. GVL, geothermal vertical loops; GHL, geothermal horizontal loops; S.&AP., students and academic planners; P.&PA., regional planners and public authorities; SD, standard deviation; DE, Germany; IT, Italy; UK, United Kingdom. German experts paid more attention to the environmental impact represented by the distance of wind turbines from important avifaunistic areas (respectively, weights: S.&AP., 0.50 and RP.&PA., 0.44). On the contrary, Italian experts expressed their preferences to the visual impact near historical and cultural facilities (S.&AP., 0.35; RP.&PA., 0.40), while English experts assigned almost equal weights to all three criteria, including the visual impact to landscape evaluable areas. All experts, in particular the Italian regional planners and public authorities (0.71) as well as the German students and academic planners (0.70), assigned the highest weight to the criteria ‘Distance from drinking water or aquifers’ for geothermal vertical loops. Similarly, the experts, except for the English regional planners and public authorities (0.32), were in agreement regarding the importance of ‘Distance from flooding areas’ (average 0.63). However, Italian experts assigned a similar weight regarding the visual impact of an additional chimney for a single power plant or a central biomass power plant near cultural/historical areas (0.48; 0.47) and landscape areas (0.52; 0.53). The results of the survey showed similarities and differences between the stakeholder group preferences from the three countries. This outcome stems from national contrasts in planning systems and in attitudes towards micro-renewables. Transferring these preferences into a spatial representation resulted in an environmental suitability map which was overlaid with the energy potential for each micro-renewable technology. Figure 9 presents the three layers for solar energy. The combined result in Figure 10 shows the optimum sites for a new settlement development according to the energy potentials and expert preferences. Overlaying of the three GIS layers (energy potential, settlement development, and settlement development using micro-generators). Suitability map for housing location using micro-solar power plants and energy potential. The suitability maps resulting from the expert surveys were compared with the micro-energy potentials. There were many areas where the energy potential was high, which also corresponded to the expert preferences, where new settlements with renewable energies should be located. The spatial results for solar irradiation reflect an (almost similar) high potential for the whole case study area. Nevertheless, areas where the potential is relatively low (areas in blue), because of the terrain aspect and slope, should be excluded. 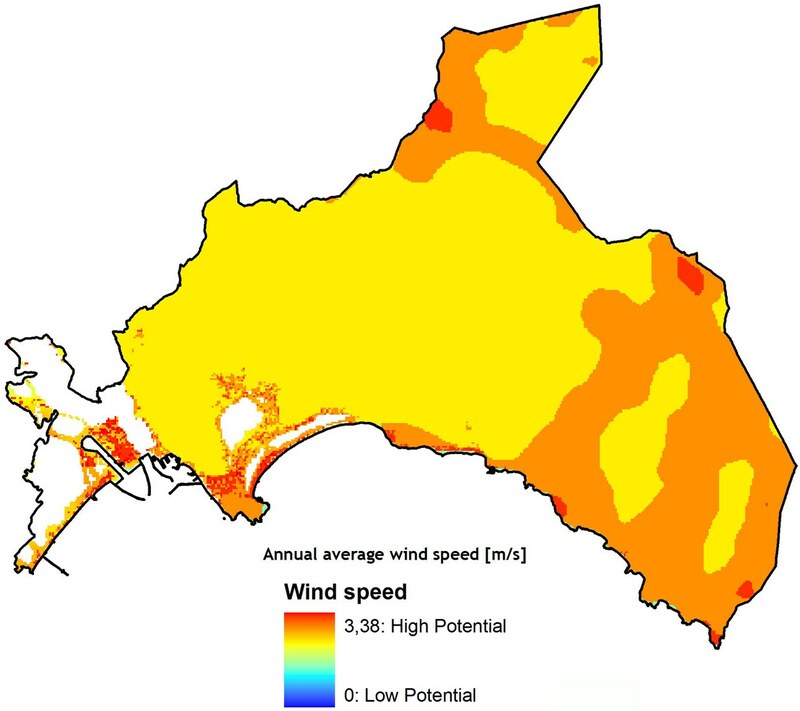 The wind potential varies along the Cagliari region. With respect to the geothermal vertical loops, all experts assigned the highest weight to the criteria ‘Distance from drinking water or aquifers.’ Geothermal vertical loops should be buried up to 100 m deep and in some cases can modify the groundwater flow with consequences on the new settlements (cf. ), and on the water quality and temperature. This has to be taken into account in the planning of new urban settlements. The geothermal energy potential map for geothermal horizontal loops and the suitability map of the expert groups showed no compliance. This is indicating that conflicts could arise if geothermally powered settlements will be planned. For this reason, it may be important to make decisions according to other criteria or needs. Only few areas located in the east of the metropolitan area showed a good biomass potential and were at the same time suitable according to the expert preferences. Consequently, other energy sources should be chosen in most of the areas far away from any forests. Decisions about the best energy mix for the different residential areas can be supported by the presented results. The proposed approach is based on an assessment of the energy potential and other relevant criteria which have been weighted by expert preferences. A method has been developed for both the integrated assessment of four renewable energy sources and the identification of suitable housing locations. The latter is done by spatially depicting general expert preferences. The accuracy in finding the most and least technical suitable locations is dependent on the reliability of the input data. The data used in this study originated from different sources and therefore also showed different levels of accuracy. For that reason, the resulting maps are less accurate than the least accurate layer used in their composition. As the methods have been successfully tested under German as well as Italian data conditions, it may be assumed that they can be applied in many European countries. Since the calculation of the solar energy potential estimation depends on the application of the r.sun model and on the pvgis data, it can be applied in every region. However, the accuracy depends on input data (DEM) and on pvgis data availability. Data of wind speeds are also available for every country. The only difference between the German and the Italian wind speeds was that the Italian data are calculated at a height of 25 m and the German ones at a height of 10 m, a height which better suits the requirements of microgeneration. Wind speeds can deliver a good approximation to the wind energy potential, but for the planning of new settlements, a simulation of the wind flow would be more useful. The accuracy of geothermal energy estimation is dependent on the data availability (e.g., the profiles) of the rock layers under the ground. This study demonstrated that even if no data on stratification and soil characteristics have been available, the information needed can be generated by the assistance of geologists with local knowledge. Nevertheless, it should be restricted to the creation of suitability maps for the use of horizontal loops. For more precision, it will be necessary to conduct further specific studies. It will also be important to have more detailed data regarding the groundwater level and movement in order to estimate the geothermal energy potential using the groundwater flow. The biomass potential estimates can be calculated in every region. Only the data about forested areas which are available for biomass use or short rotation coppice are required. The next step will be to estimate the wood extraction capacity and transportation costs. The best energy mix, calculated after normalization and overlay, could be derived more precisely if other criteria were included, e.g., costs, local characteristics, as well as electricity and heat needs. Such results would better support the practical planning. Methodologically, multicriteria evaluation methods in a GIS could be used for this optimization of settlement allocation with respect to sustainability. Expert weighting of criteria about the location of an energy-efficient residential development in combination with the use of GIS and multicriteria analysis were useful for supporting the complex planning process. Various experts independently came to a considerable degree of agreement about their general preferences. The proposed method offers some advantages over the classical site suitability analysis techniques: First, it provides a structured approach to derive the suitability by ‘decomposing’ a complex problem into three levels (energy potentials, expert preferences for housing development, expert preferences for housing development with micro-generation technologies). This allows planners and public authorities to focus on a systematic analysis of the factors for each level. A disadvantage is that the criteria are less differentiated than in a conventional environmental impact or suitability assessment. Also, supplementing with new criteria needs considerable effort. Second, this method allows for incorporating criteria, which differ in nature. Furthermore, the method is a suitable way to weight the different criteria if no democratic legalized standards are available as a basis for weighting and decision making. Third, the approach provides an opportunity for decision makers to incorporate their own judgments. However, for a transparent practical application, the general expert preferences, which substitute the legal valuation and assessment standards, have to be presented separately from the preferences of local politicians and stakeholders. Fourth, the general preference and not a special site-specific individual interest is relevant, which may help at the same time to support rational decisions, in particular in local development and achieve a good acceptance of the results. Fifth, if regional/local stakeholder preferences are taken as a basis, the methods can be used in order to model the probable future expansion of housing development according to local interests. If mandatory zoning is weak or non-existent, land use planning can use this information for strategy building. In the future, more concrete legal standards and priorities for decisions about energy-efficient housing and the environment may more strongly confine the importance of the expert preferences. In that case, both more predefined priorities should be included in the method and their combination with conventional impact assessment should be recommended. Environmental planners and public authorities often make complex decisions within a short period of time when they must take into account sustainable development and participation. A set of land-use suitability maps (e.g., as part of a landscape plan) would be very useful for supporting fast decisions. Once the maps are available, land planners can analyze any new project by using simple operations such as map overlay or statistical analysis of a given area. Clearly, the criteria selected for housing development and for micro-renewable preferences need to be combined with other siting factors which are relevant on broader scales. In this context, it will be interesting to compare the landscape plan of Sardinia and the land use plans of the municipalities with the results obtained in this work to identify the benefits and limitations. For further research, we will also integrate a few territorial and landscape-geographical aspects on a larger scale (e.g., a local scale) in order to compare them with those of the energy potentials. The aim is to give a more complete assessment to support planning decisions by integrating relevant territorial, environmental, and landscape criteria for assessing the new housing development. The need to reduce the oil consumption and to produce renewable energy favors the integration of micro-renewable energy generation into housing development. Urban and regional planning can optimize this integration by selecting the best suited areas with the highest energy potential and the least environmental impacts as well as by choosing the best mix of renewables for each individual residential site. 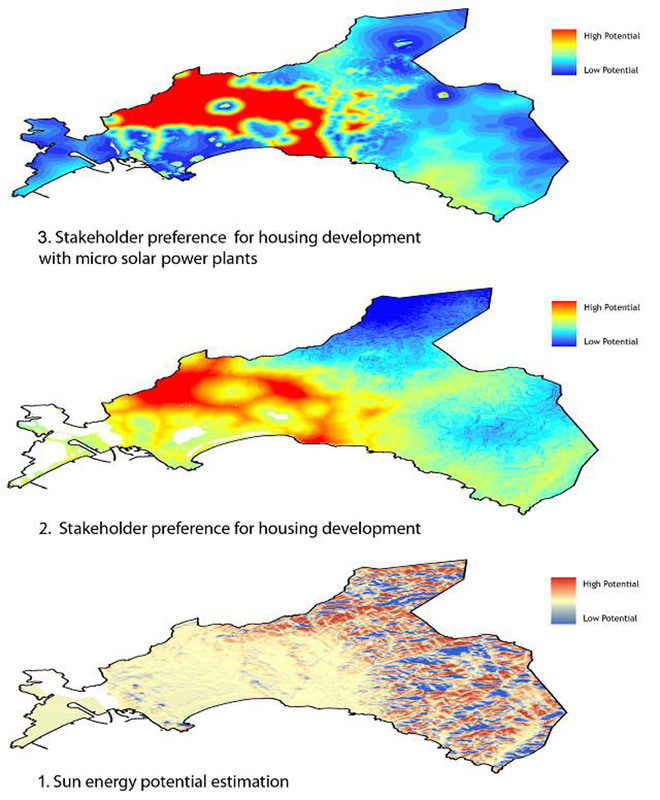 This paper suggests a methodology for finding the best locations for new housing developments which use micro-renewable technologies. The results obtained are of direct relevance for practical planning in different European countries. The methodology proposed can be an effective tool for planners in Europe to simulate new residential areas and evaluate their energy potentials for tracking changes and identifying the best solutions. CP received the title of Doctor Europeus from the universities of Cagliari and Hannover in 2011. Her research interests are centered on the integration of micro-renewable technologies in regional and urban planning. This study of the integration of micro-renewable technologies in regional planning was financially supported by the Italian Ministry of Education, University and Research (Ministero dell’Istruzione, dell’Università e della Ricerca (MIUR)). CP conceived and carried out the study and drafted the manuscript. She worked on all parts and in particular on the adaptation and development of methods for the estimation of the micro-energy potentials. EA helped define the general methodology of the study, participated in the design, landscape criteria selection, and planning in the eastern metropolitan area of Cagliari, and supervised the survey in Italy. AL helped develop the structure of the paper and supervised the multicriteria analysis, GIS work, and the survey in UK. CvH helped define the general methodology of the study, participated in the environmental impact selection of micro-renewable technologies, landscape, and regional planning, and supervised the survey in Germany. All authors read and approved the final manuscript. International Energy Agency (IEA): : Key world energy statistics. 2007.. http://www.iea.org/textbase/nppdf/free/2007/key_stats_2007.pdf. Accessed 21 September 2010.